In 1982 Dr. h.c. Daniel Blaise Thorens met his future wife, Finnish born Riitta H. Thorens-Hietanen. She came from Finland to Basel to study art history at the University of Basel, where she graduated with an essay on Le Corbusier as a painter. In 1987 our gallery began to purchase original works by Le Corbusier and thereafter many exhibitions all over the world contained works by Le Corbusier owned by our gallery. We can claim, without any exaggeration, to have become one of the principal galleries for Le Corbusier’s works, underlined by the fact that we have sold more than 1800 works by Le Corbusier since 1987. Our company is the only gallery dealing in works by Alfred Heinrich Pellegrini (the grandfather of Dr. h.c. Daniel Blaise Thorens), one of the leading and most successful Swiss artists of the 20th century. Since 1987 our gallery has bought and sold more than 600 paintings and works on paper by Alfred Heinrich Pellegrini. Further we exhibit the works of many well known Swiss artists such as Caspar Abt, Anne Bruchesi, Luciano Castelli, Rosemonde Krbec, Christian Peltenburg-Brechneff, Fifo Stricker, Andreas Rickenbacher and Walter Ropélé. One of the highlights of our activities was a very special exhibition of David Bowie’s visual art in our gallery in 1996. The exhibition did not only attract the attention of the public and the media, it also turned out to be a huge success with collectors, who bought almost all of the works displayed by our gallery. We are proud to say that as a result of our exhibiton, David Bowie’s visual art work has become a widely appreciated part of many important art collections all over the world. Now we concentrate on our artists and we are dealing with very important works by artists of the 20th century. In 1996 Dr. h.c. Daniel Blaise Thorens and his wife lic. phil. 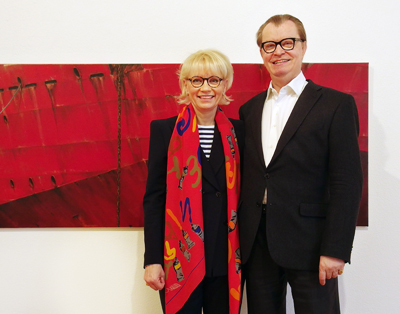 Riitta H. Thorens, art historian, started to help artists in distress with their own Fondation Thorens which has meanwhile helped more than 1000 artists with an amount much higher than CHF 3′000′000.– till today.